Street and/or Road Design Standards by Classification. (b)	Streets and Roads shall be continuous, designed to ensure free movement of multi-modal traffic and pedestrian flows, and terminate at the exterior boundary of the project unless the Director determines allowing a lesser distance is in the public interest. In certain circumstances, the DEC may allow this requirement to be met by the dedication of a Right-of-Way and/or utility Easement(s) as may be required by MassDevelopment. (c)	Circulation, including vehicular, pedestrian and bicycle, shall be designed with respect to topography, integration with surrounding Streets and/or Roads, connection to existing or future pedestrian ways, interior circulation and the separation of pedestrians from vehicles. Bicycle accommodations shall be in accordance with current State and Federal requirements. Neighborhood Roads and Roads (alleys) will be designed as shared use facilities where pedestrians and bicyclists have priority over motor vehicles. Refer to 974 CMR 2.07(3)(b) regarding the design of Neighborhood Roads and Roads (alleys). (d)	Developments and Streets and/or Roads shall facilitate trail Access in accordance with the Devens Main Post Trails Master Plan and shall follow the Trail Design Guidelines. Applicants shall provide the DEC with Access Easements over ways and trails that are intended to be accessible to the public. (e)	Street and/or Road widening, narrowing, or inclusion of traffic calming measures to assure safety for all users or improve roadway channelization and controls may be required by the DEC.
(f)	Water mains shall connect to the Devens water supply system and the system shall be designed to form a continuous loop with existing or proposed water mains. Dead end mains are not permitted. (g)	Reserve strips prohibiting Access to Streets and/or Roads or adjoining property are not permitted, except where, in the opinion of the DEC, such strips restrict Access in accordance with the public interest. (h)	Prior to the construction or substantial modification of Street and/or Roads, test pits and/or soil borings shall be performed at locations along the centerline to depths specified by the Director to determine whether the existing soil can adequately support the Street and/or Road. If the soil testing reveals that the soil conditions are not appropriate to support the proposed Street or Road, or other structures, the applicant will be responsible for submitting alternative methods of construction based on recommendations from a registered structural and/or geotechnical engineer as appropriate. (i)	Street names shall be subject to approval by the DEC. Street and/or Road signs of the type and character used within Devens and approved by MassDevelopment Engineering bearing the name of the Street and/or Road shall be provided at all intersections and shall be installed by the Applicant at its cost when the binder course of the roadway is installed. Safety and traffic control signs shall be installed by the Applicant in conformance with the Manual on Uniform Traffic Control Devices (MUTCD), the Massachusetts Department of Transportation (MassDOT) revisions to MUTCD, and DEC requirements, as applicable to the specific project location. Historical ovals of the type and character used within Devens and approved by the DEC shall be provided and installed by the Applicant at its cost when the binder of the roadway is installed. (j)	Plans for Ways proposed for public acceptance shall provide for adequate private long-term Way and associated infrastructure maintenance unless and until the MassDevelopment accepts the Ways or agrees to maintain. (k)	Dead-end Streets and/or Roads or cul-de-sacs shall only be permitted if the Applicant demonstrates to the satisfaction of the DEC that connecting to other Devens ways is impractical or unreasonable. Gated communities are prohibited. (l)	If the DEC allows cul-de-sacs, they shall have a minimum required outside turning radius of 35'. The centers of the cul-de-sacs shall be comprised of pervious materials and shall be utilized for stormwater management (biofiltration landscape island). The Applicant shall provide pedestrian and bicycle connections to and from the end of the cul-de-sac. Design Standards by Street and Road Classification. All Design Standards apply to both Streets and Roads. In accordance with the Bylaws, all "Streets" are Public Ways and "Roads" are private ways. Table 1 lists the Design Standards for Streets and Roads and indicates which classification is allowed to be pubic and/or private. In addition to Table 1, the following additional design standards also apply to the specified Roads. (a)	Road (alley). Minimal pavement is to be used in Roads (alleys). 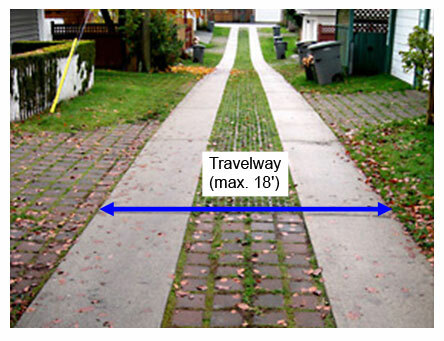 The travelway shall be no greater than 18' and shall consist of pervious pavement such as pervious asphalt, permeable pavers, or a mix of other similar Low Impact Development (LID) approaches where feasible or any combination of pavement and pervious materials that increases the infiltration rate in accordance with 974 CMR 4.08.
paving materials to meet infiltration rate requirements in 974 CMR 4.08. (b) Neighborhood Roads. Neighborhood Roads are intended to be less formal than traditional, more highly trafficked Streets or Roads. Creativity in developing the design of these facilities is greatly encouraged. Therefore, these Regulations do not include strict design standards. Applicants proposing these types of facilities should be familiar with other Shared Streets facilities that have been designed and constructed and are strongly encouraged to engage professional Landscape Architects and Professional Engineers experienced with the design and construction of Shared Streets (see Figure 2 for an example of a Neighborhood Road layout). Minimal pavement is to be used. Pervious pavement and landscaping shall be the primary means of infiltrating stormwater runoff generated by the neighborhood. The Applicant shall be responsible for proposing other means of handling stormwater runoff in accordance with 974 CMR 4.08. 4. Recreational or playground facilities if desired by the developer or required by the DEC.
5. A length limited to serving a maximum of 150 Average Daily Traffic (ADT) from 15 Dwelling Units. 6. Traffic-calming measures to achieve 10mph design speed. The design should limit forward visibility for vehicles to a maximum of 40'. a.	Constructing gateways including narrowing the entrance to the shared zone of the Neighborhood Road from a standard Street or Road. Gateways may include the installation of planters or removable bollards. The gateway design and installation should not restrict entry to the area by emergency vehicles or block crosswalks. b. Consider raising the entrance to the Neighborhood Road so that vehicles, bicyclists, and pedestrians must ascend into the shared area. c.	Post signage indicating speed limits and instructions to yield to pedestrians. d.	Install different paving materials at the entrance to and throughout the Neighborhood Road to indicate to drivers, bicyclists, and pedestrians that the Neighborhood Road is not a traditional street. e.	Introduce chicanes (serpentine pathways) for vehicular and bicycle travel. 10. Landscaping and other Improvements to facilitate pedestrian movement/activity. 11. Garages serving homes on Neighborhood Roads shall use Roads (alleys) where feasible. If garage doors open onto a Neighborhood Road, the travelway shall provide 28' separation between opposing garage doors or 24' between a garage door and the far side of the travelway not abutting a garage door. (c)	For Local Streets, Minor Collectors, Major Collectors and Boulevards, refer to Table 1. 1. Sustainable Neighborhood Road Design: A Guidebook for Massachusetts Cities and Towns by American Planning Association Massachusetts Chapter and Homebuilders Association of Massachusetts, May 2011. 3. American Association of State Highway and Transportation Officials (AASHTO), 6th edition, (2011). Watermain - Class 52 Cementline Ductile Iron Pipe ≥ 8 inch ≥ 8 inch > 8 inch min. > 8 inch min. ≥ 8 inch min. > 8 inch min. Hydrant Spacing N/A 500 feet max. 500 feet max. 500 feet max. 500 feet max. < 500 feet max. Gravel Base - MHD M.1.03.0. Planting Strips N/A N/A 3.5 feet wide min. 3.5 feet wide min. 6 feet wide min. 6 feet wide min. *Right-of-Way refers to total area of Streets and Roads including travelway, shoulders, sidewalks, planting strips and any improved areas beyond. The DEC will consider other traffic calming measures on a case-by-case basis. Refer to MassDOT, Highway Division, Project Development & Design Guide, 2006 (MHD) for details. (a)	Where curbs are necessary to protect the roadway edge or to direct drainage, perforated curbs (that allow runoff to flow into swales) or curbs set flush with pavement may be considered. Bituminous concrete curbing is not permitted within public or private Rights-of-Ways. (b)	Where curbs are not necessary, the edge of road shall be protected with a grass strip flush with the pavement or by other means acceptable to the DEC and MassDevelopment. (c)	Cement concrete or vertical granite curbing with a specified reveal shall be installed in all other areas where LID design techniques have not been incorporated. (d)	Whenever the profile or type of curbing material changes, matching transition curb sections shall be installed. (e)	Guard rails are required off of the edge of Streets/Roads with improved/unimproved shoulders that abut steep slope areas. Intersection Design Standards. While vehicular traffic flow should be carefully considered, creating safe crossings and accommodating pedestrians, vehicles and bicycles as much as possible in the Right-of-Way takes precedence. Reasonable reduction of vehicular traffic capacities and level of service at intersections are justified when high volumes of pedestrians and bicyclists are present. (a)	Streets and/or Road intersections shall be designed to ensure free movement of Pedestrian, bicycle and vehicular traffic. (b)	Streets and/or Road intersections shall align and connect with existing ways at 90 degree angles to the maximum extent feasible. Streets and/or Roads shall not have intersecting angles less than 60 degrees. (c)	All intersection designs shall comply with MassDOT, Highway Division, Project Development & Design Guide, 2006 (MHD). (a)	Overview: Stormwater Management within subdivisions generally consists of the control of stormwater runoff within ways. It is characterized by common, multiple user drainage collected in the ways and directed towards appropriate receptors. MassDevelopment will usually maintain or oversee maintenance of these public stormwater management systems. (b)	All Stormwater management systems shall comply with 974 CMR 4.08. (c)	The stormwater management system for the subdivision may be designed and constructed to include drainage and run-off from developed sites as well as the roadway. The Director may require the Applicant to provide a stormwater management plan for the entire subdivision at full build-out to minimize the total number of detention/retention basins. 1. Biannual inspection of detention/retention and infiltration facilities for Erosion, debris, sand deposits, and vegetative growth. Vegetation shall be cut back annually, as appropriate, and debris or sediment removed from the basins. 2. Submission of an annual report to the DEC by the Applicant of the detention/retention basin to the DEC indicating that maintenance issues have been adequately addressed and that corrective measures were made where necessary. Landscape Treatment within Street/Road Rights-of-Way. (a)	Purpose. When a new Street and/or Road is built or substantially upgraded, the Applicant shall provide street trees and planting strips. 1. Minimum sizes for plant material, other than for specific uses indicated elsewhere in 974 CMR 2.00, shall be in accordance with 974 CMR 3.04(8)(c). 2. Street Trees are shade trees located along a Road and/or Street. Applicants shall plant Street Trees in accordance with 974 CMR 3.04(8)(k). Multiple species may be used on the same side of any street between intersections. a. All unpaved areas within the Right-of-Way (public or private) shall pitch at 1:50 minimum. b. All unpaved areas within the Right-of-Way with a gradient between 1:50 and 1:3 shall be lawn. Grass shall be sod, seed, or hydroseed using species mix composition typically used in New England for grass receiving routine mowing. c.	Any unpaved areas within the Right-of-Way between 1:3 and 1:1.5 shall be planted with low shrubs (under 3' height at maturity) or groundcover, having fibrous root systems to control Erosion. d.	Slopes created to meet existing grades within or immediately adjacent to the Right-of-Way shall not be greater than 1:1.5. Where space is limited or nearby existing trees/woodland are being retained, the Applicant shall provide retaining walls to avoid slopes steeper than 1:1.5.
e.	Retaining walls under 4' retaining height shall be mortared fieldstone wall construction with dry-laid look, brick, or flat face "lock blocks" in a natural stone color acceptable to the DEC. Retaining walls 4' height or greater shall be concrete with a fieldstone or brick veneer, or flat face "lock blocks" in a natural stone color acceptable to the DEC.
f.	Within the Rail, Industrial, and Trade Related District and the Environmental Business District only, the use of trap rock for bank stabilization may be substituted in the place of the recommended shrubs. Proposed retaining walls may be concrete. 4. Shrubs. The following list of native shrub species is recommended for their high performance in slope stabilization, urban, and roadside conditions. Substitutions must be able to demonstrate suitability to the satisfaction of the DEC.
Cornus sericea 'Kelseyi' Kelsey Dwarf Red Osier Dogwood 12" - 15" 18" o.c. Ilex verticillata 'Nana' Dwarf Winterberry 18" - 24" 2' o.c. Rhus aromatica 'Gro-low' Dwarf Fragrant Sumac 15" - 18" 18" o.c. Vaccinium angustifolium Lowbush Blueberry 1 gal 2' o.c. In addition, the following list of non-native species may be used for bank stabilization, urban, and roadside conditions. Substitutions must be able to demonstrate suitability to the satisfaction of the DEC.
Cotoneaster horizontalis Rockspray 18" - 24" 2' o.c. Hedera helix'Baltica' Baltic Ivy 2 yr. 8" o.c. Juniperus chinensis sargentii Sargent Juniper 18" - 24" 2' o.c. Juniperus horizontalis varieties Creeping Juniper 18" - 24" 2' o.c. Spiraea bumalda 'Anthony Waterer' Anthony Waterer Spirea 18" - 24" 2' o.c. Vinca minor Periwinkle 2 yr. 8" o.c. a.	Vertical alignment of Streets and/or Roads and sidewalks running through areas of undisturbed woodland or mature trees shall follow the existing topography to the maximum extent feasible to reduce the impact to undisturbed woodland within and adjacent to the Right-of-Way. b.	Topographic alteration and the removal of vegetation beyond the limits of the proposed Right-of-Way shall be kept to the minimum possible extent to meet existing grades. c.	Vegetation shall be cleared from the Right-of-Way only as needed to accommodate roadway, Utilities, and sidewalks. d.	Significant trees (minimum 12" caliper) or woodland vegetation outside the roadbed within the Right-of-Way shall be preserved by adjusting the alignment of Utilities and sidewalks to avoid the trees. The Applicant shall provide tree wells for any grade change of 6" above or below existing finish grade within 6' of the trunk of a tree to be preserved. Use of dry laid fieldstone construction for tree wells is encouraged.e. All work within the root zone of existing trees to be preserved shall be carried out under the direction and supervision of a certified arborist. Sidewalks are designed primarily for pedestrians. Sidewalks shall become part of a continuous system. All sidewalks shall be Americans with Disabilities Act (ADA) compliant, and conform to the Massachusetts Architectural Access Board (521 CMR) requirements and shall include transition intersections with tactile strips at crosswalks. There shall be three types of sidewalks in Devens: Minimum Standard, Higher Standard, and Highest Standard. Minimum Standard Sidewalks are constructed in areas with lower levels of pedestrian traffic and where appearance is typically of less importance. These areas include the Rail-Related District, the Environmental Business District, and the Special Use II District. In the Innovation Technology Business District and the Gateway I and II Districts, Minimum Standard Sidewalks shall be constructed along Minor Collector Streets/Roads, while Higher Standard Sidewalks shall be constructed in Residential Districts, along Major Collector Streets and/or Roads. Highest Standard Sidewalks are used in areas with relatively high levels of pedestrian traffic. a. Minimum Standard Sidewalks shall be constructed of bituminous concrete, 5'-0" minimum width, and shall comply with the dimensions and specifications of the sidewalk details of 974 CMR 2.00.
b. Higher Standard Sidewalks shall be constructed using cement concrete with an SRI of at least 29 and shall be 5'-0" minimum width, and shall comply with the specifications in Appendix B. Applicants are encouraged to use pervious concrete. Refer to 974 CMR 4.08(5) for pervious concrete construction specifications. c. Highest Standard Sidewalks Uses that generate particularly high levels of pedestrian activity, such as schools, transit stops and places of public assembly shall have cement concrete sidewalks that are the Highest Standard and have a 7'-0" minimum width across the entire Lot frontage. The DEC may allow a lesser width (but in no instance less than 5'-0") or sidewalks along a portion of the frontage, if the DEC finds adequate pedestrian access and safety will be provided. Sidewalks shall run continuously on both sides of all Streets and Roads to the maximum extent feasible. Sidewalks shall be separated from Streets and Roads by a landscape strip at least 3' wide. Where Street trees are provided between the sidewalk and Street/Road, the landscape strip shall be increased to an appropriate width to ensure survival of the street trees. Refer to 974 CMR 3.04(6)(a)1. for additional sidewalk requirements. All lighting shall comply with 974 CMR 3.04(6). Light poles shall be located and spaced to ensure safe and adequate light levels for all Streets and/or Roads, intersections and sidewalks. Refer to Table 1 for maximum spacing and height restrictions for all Roads/Streets. Fixture height is measured from the ground to the top of the light fixture/post assembly. Within all districts (except the Historic District overlay) fixtures shall comply with 974 CMR 4.04 and the applicable MassDevelopment Devens Design Guidelines for Devens Industrial Park. Within the Historic District overlay, street light fixtures and poles shall comply with the Report: Street Lighting Recommendation for Devens Historic Overlay District prepared by Carol R. Johnson and Associates of Boston, MA dated November 30, 2001. Trails - When a portion of the public trail system or private connections to the public trail system as shown on the Devens Main Post Trails report dated July 2001 and any amendments thereto adopted by the DEC, falls within the land to be subdivided, the Applicant shall provide an Easement and construct that portion of the trail on the parcel/project site. The trail detail is shown as 974 CMR 3.06(12) Figure L. Depending on the size and use of a proposed subdivision, DEC may require connectors to the main trail system in addition to or in lieu of sidewalks. (a)	Parking bump-outs shall be designed to easily convert to transit stops when transit service becomes available. (b)	Transit stops shall be sited in accordance with the MassDOT, Highway Division, Project Development & Design Guide, 2006 (MHD), Section 6.3.4. Enough waiting area for passengers without interfering with the flow of pedestrians walking by and also provide safe and convenient Street and/or Road crossings to access the stop. Shelters positioned so riders in wheelchairs have enough room to enter and exit the shelter. The sidewalk behind the shelter shall be wide enough for two wheelchair users to pass each other and to handle the expected levels of pedestrian activity. Adequate lighting for safety and visibility. All lighting shall be shielded with full cut-offs and not spill over onto adjacent properties or into the Street and/or Road or create a visual hazard/glare for road traffic. An area to accommodate posting of schedules and route maps and any local ride share programs in addition to the ability to accommodate electronic schedule displays.